Join us in Payson in the cool pines beneath the Mogollon Rim for Payson’s first ever book festival. More than 60 authors will participate. 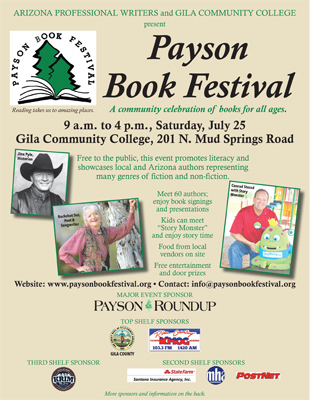 Gila Community College and Arizona Professional Writers (APW) are partnering to present the Payson Book Festival on July 25, 2015, at the Payson campus, 201 N. Mud Springs Rd. in Payson, Arizona. This is a family-oriented event and is offered to the public free of charge. A children’s element will feature story time, a young writer’s workshop and an opportunity to meet “Story Monster.” Entertainment, workshops, speakers and author signings will take place throughout the day. Food is available. See PaysonBookFestival.org for more information. You can also download the Book_Fair_flyer, which includes the schedule of events. Come support the book festival! Volunteer to help or come meet the authors and check out their books. Beginnings and endings – get it right! Join the Rim District of Arizona Professional Writers for their monthly meeting on April 15. 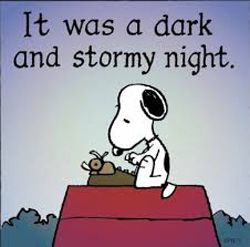 The topic is “Beginnings and Endings”….. two areas that challenge writers of fiction and non-fiction. Participants are invited to bring some samples of good ones and the group will then do some creative exercises. Both those who write novels and magazine articles will benefit. Rim Country Literacy is having a book drive, so please bring a book to donate to this cause. The meeting will be held at noon in the community room of the Payson Public Library. We also will discuss the APW State Convention on May 2 in Scottsdale. Hope to see you at the April 15th meeting! Contact Carol Osman Brown, District Director at 928-468-9269 if you have questions. 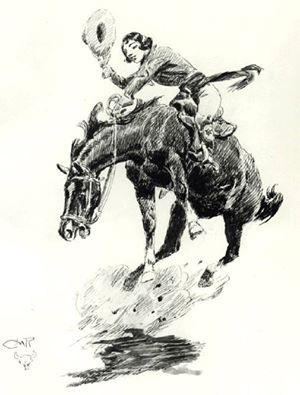 Dig out your cowboy hats and boots and join the APW Southern District “Writing the West” luncheon at 11:30 a.m., Wednesday, April 22, El Charro Cafe, 311 N. Court Ave., Tucson. This is the day before the Arizona History Convention begins in Tucson, so out-of-towners going to the history convention should plan to join us. APW members and Tucson-based western history writers Jane Eppinga, Jane Cleere, and Barbara Marriott speak about their latest work and recommendations to attendees who might wish to start writing in this genre (nonfiction and fiction). Open forum with questions and answers follows speakers. Free to attend. Lunch is Dutch-treat. Info/RSVP: Jaimie Bruzenak calamityjaimie@gmail.com, 928-607-3181 or apw.reservations@gmail.com. And, yes, wear that western attire! Yipee ki yea! Members and guests of Arizona Professional Writers (APW) will have a behind-the-scenes tour of the Scottsdale Museum of the West, 3830 N. Marshall Way, Scottsdale, at 5 p.m. Thursday, April 16, conducted by Michael Fox, CEO and director of the museum. The cost is $11, with no-host dining to follow off-site. For more information or to RSVP, contact Brenda Warneka, 602-740-9579, or warneka@cox.net or via email to apw.reservations@gmail.com. The museum, which opened in January 2015, celebrates the 19 states that make up the American West. There are 12 galleries of paintings, statuary and other collections. A Western-themed “Step into the Picture” display allows visitors to have photos taken as appearing to be part of the old-days scene. Non-flash photos will be permitted throughout the tour. Watch the APW Facebook page for more details. Those attending are encouraged to dress Western. April 2015 TypeRider now available! You won’t want to miss the April, 2015 TypeRider! It’s full of news about recent happenings throughout the state and about upcoming events. 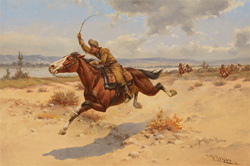 There are a number of Western-themed events coming up highlighted in this issue: a tour of the new Museum of the West in Scottsdale, the Southern District’s “Writing the West” lunch and talk, plus information about the Arizona History Convention held this year in Tucson at the end of the month. And, there is so much more! Start the New Year off right by reading the January 2015 APW TypeRider! See lots of photos of fellow members enjoying holiday get togethers. Read about the newest district of APW and the rules for the 2015 Communications Contest. APW will be having its own contest again, rather than participate in the at-large contest. In this issue you can also meet Jodi Weisberg and find out about writing events coming up this spring. If you haven’t seen the August, 2014 TypeRider, take a look now! It’s another issue packed with information. Read about the Rim Country Wrtier’s Retreat, meet Suzanne Pickett Martinson and the law about using photography of people in public places. There is also a long list of local writing-related activities. Be sure to check them out.